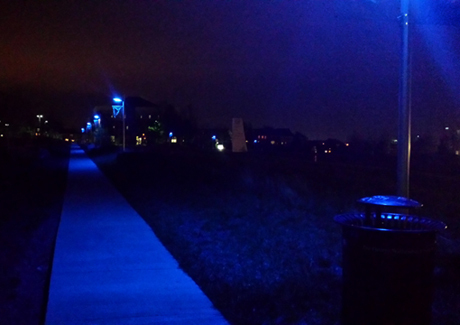 VSTC’s Solar Sidewalk will be illuminated with blue lights throughout the month of April in commemoration of World Autism Awareness Day. 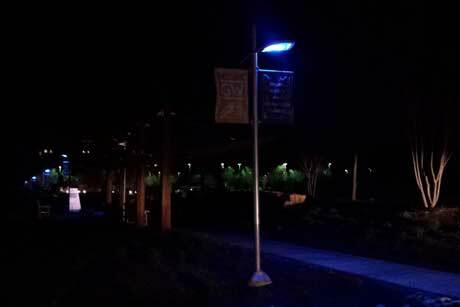 GW “Lights it Up Blue” throughout the month of April to commemorate World Autism Awareness Day. Autism Speaks, the world's leading autism science and advocacy organization, developed the “Light It Up Blue” campaign to support and raise awareness for the millions of people the world over diagnosed with autism. GW will invest more than $5 million to establish the GW Autism and Neurodevelopmental Disorders Institute (AND Institute) as a leader in autism research and policy. The university recently announced the selection of Kevin Pelphrey as the inaugural director of the AND Institute. Dr. Pelphrey brings more than 15 years of experience in autism and neuroscience research, most recently as director of Yale University’s Center for Translational Developmental Neuroscience. As the founding director, Dr. Pelphrey will refine and implement the vision of the Institute as a resource that offers evidence-based clinical treatments and conducts research on the full spectrum of autism. The Institute will be primarily based at VSTC, with a dual presence in Washington, DC, to support cross-disciplinary collaboration with GW faculty and external partners. In partnership with Children’s National Medical Center, the Institute will focus particularly on adults with autism, a rarely covered age range in the field. In addition, Dr. Pelphrey will encourage research on females with autism, as they exhibit signs differently than males and are often diagnosed at a later age. The Institute anticipates offering clinical services and support, as well as research opportunities, for young children on the autism spectrum at VSTC and for older children and adults in Washington, D.C.
Pelphrey aims to make the new Institute a “one-stop” resource for families affected by autism in the Washington metropolitan region. According to the Autism Speaks website, autism spectrum disorder (ASD) and autism are both general terms for a group of complex disorders of brain development. These disorders are characterized, in varying degrees, by difficulties in social interaction, verbal and nonverbal communication and repetitive behaviors. In 2013 significant changes were made to medical classification standards, resulting in all autism disorders being merged into one umbrella diagnosis of ASD. Previously, they were recognized as distinct subtypes, including autistic disorder, childhood disintegrative disorder, pervasive developmental disorder-not otherwise specified (PDD-NOS) and Asperger syndrome. ASD can be associated with intellectual disability, difficulties in motor coordination and attention and physical health issues such as sleep and gastrointestinal disturbances. Some persons with ASD excel in visual skills, music, math and art. Can a Robot Help Kids with Autism Navigate Social Situations?